Set your sound apart with FX-Tracker, a unique multi-effects unit that allows guitar players to control their sound by changes in their playing style. 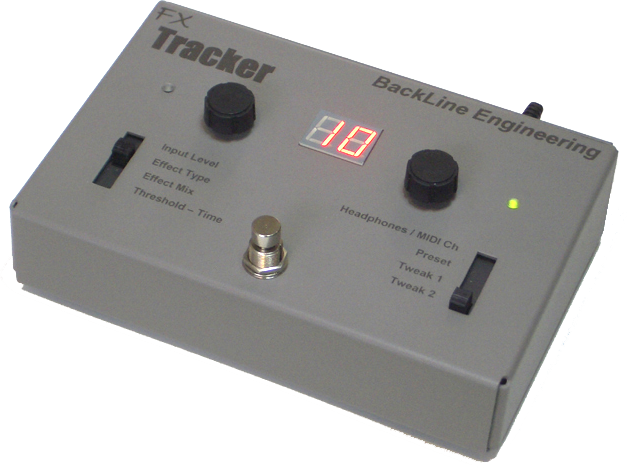 FX-Tracker utilizes the note recognition technology developed for the successful RiffBox looping device while incorporating many of the effects popular with musicians today. This allows you to tailor your own unique sound beyond what can be created using standard effects devices. FX-Tracker includes 87 effects in the categories of Delay, Chorus, Tremolo, Flanger, Filter, Pitch Shifter, arpeggiator and MIDI output. With most of these effects, you can control timing or intensity of the effect by changing your playing speed or your pick attack. An additional delay effect can be placed before, after or in parallel with any of these effects to create unique layered sounds. FX-Tracker is easy to setup and use. Plug your guitar into the input and run a cord from the output to your amp or effects pedal. Set the left switch to control which effect type is selected. Now you can use the lower two switch positions on each side to set four parameters that control the effect that was selected. Or you can also simply set the right switch to control which preset is selected and just dial through all the factory presets. An additional delay effect can be placed before, after or in parallel with any of the six main effect types. This allows you to do things like effect only the straight signal or only the delayed signal or both. 17 effects that output MIDI CC messages as waveforms, envelopes or arpeggio patterns based on your playing speed or pick attack to control other effect units or synth modules. Use and external MIDI expression pedal to manually modulate chorus, flanger, and filter or create a whammy pedal.